Earnest Kookaburra: Can anyone can call themselves a doctor in Australia? 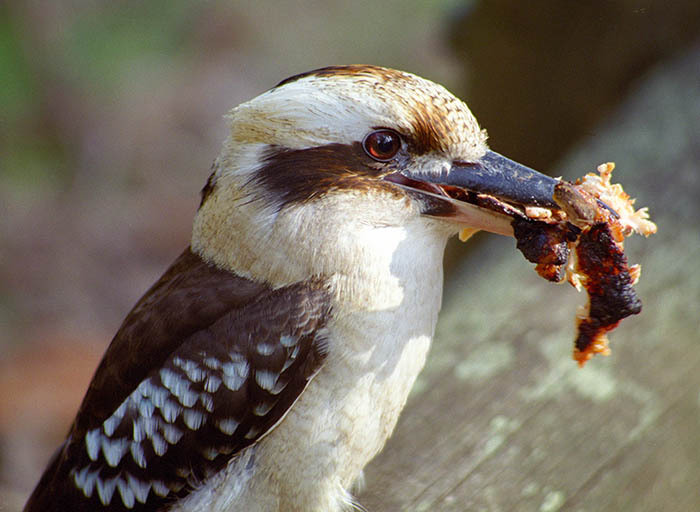 The kookaburra's natural disposition is laughter. But sometimes they are curious, searching, and need to bash the lizard till well after it is dead. Can anyone can call themselves a doctor in Australia? What did surprise me was the use of the title "doctor" by a number of health practitioners who gave no appearance of having either a medical degree or a doctorate of any kind. (This photo is of a glass door leading into the practitioner's room. The door has the sign on it. The practice is at a swimming pool which is reflected in the door, although the photo looks like the sign is hanging in empty space or superimposed on a photo of the pool. It was taken by me in January 2012). This practitioner styles herself "Dr". She appears to have a bachelor's degree in science and a masters degree in health science specialising in osteopathy. She does not list a medical degree or a PhD or other doctorate in any discipline. The national register for Australian Health Practitioners confirms these as her qualifications. I make no criticism of this individual - it appears to be a common approach adopted by a number of health practitioners and approved by their regulatory authorities. But I do question the policy stance of the law if it really allows this to happen. "This would never happen in NSW", I blithely thought to myself. "This is Queensland after all - the State whose longest serving Premier tried to allow a Quack cancer therapist to set up shop. Queensland is the flaky state". Queensland has had its scandals and formal inquiries about bad medical practice. I was sure things would be improving, but perhaps they hadn't yet touched the complementary and alternative fringe. With an air of anticipatory southern state superiority, I looked up the NSW law on the question....oh, the shame! The NSW law appears not to prevent it either. I was sure there used to be a law against falsely calling yourself a doctor in NSW. There is for lawyers (see here and here). How had this happened? How could the rigour and esteem of the once proud NSW medical profession have been thrown to the wind? (b) the person is registered as a medical practitioner under this Act. Maximum penalty: 50 penalty units or imprisonment for 12 months, or both. (2) A person who is not a registered medical practitioner must not advertise himself or herself, or hold himself or herself out, to be a registered medical practitioner, doctor of medicine, physician, surgeon, legally or duly qualified medical practitioner, qualified medical practitioner or medical practitioner. The key point is that the terms "doctor", "physician" and "surgeon" do not appear in the Table above. While nobody who is not registered as a "nurse" can use the title "nurse" in a way that could reasonably be expected to induce the belief that the person was a nurse, the law does not protect the title "doctor" in the same way. This law does not it in its terms prevent any of these health professionals from titling themselves "doctor", at least so long as they state the type of health practitioner they are. Some of the health and related professions on this list are quite scientifically oriented. Others are not. The mere fact that one is scientific ought not, in my opinion, entitle the use of the title "doctor" unless you are qualified as a medical practitioner or hold a doctorate awarded by a recognised university. No doubt there are members of all of the above professions who hold doctorates. Most do not. Those that don't should not use the title "doctor" unless they are a medical doctor.Why should this exception apply only to medical practitioners (ie only to doctors)? Because that is what the word "doctor" means by its ordinary accepted usage. Surprisingly, the Australian medical profession appears to have been slow to protect the title of doctor. In its joint submission (along with other Australian medical bodies) on the exposure draft of the national law, the AMA did not take up the issue of when could someone use the titles "doctor", "physician" or "surgeon". Their only concern appeared to me to be distinguishing medical doctors from PhDs. (This is redolent of what one hears about medical doctors being concerned about status in clinical case conferences and ensuring everyone knows if a person has a doctorate instead of a medical degree). the title is used, such as:... Dr Walter Lin (Chiropractor)." How this makes it clear that the person using the title doctor is not a medical practitioner is beyond me. An uninformed but intelligent layperson may well assume that the person is a medical practitioner who also has qualifications in chiropractic therapy; just as there are many medical practitioners who also have qualifications in acupuncture, Chinese medicine or otherwise regard themselves as "integrative". In other words, chiropractors acknowledge that it may be misleading for a psychologist to call themselves doctors, even if they hold a doctoral degree (if they don't also specify it is not a medical doctorate), but it is not misleading for a chiropractor who does not hold any qualification generally understood to be that of a doctor to do so. Incredible. And what's more, the guidelines don't even try to construct an argument about why they should now suddenly be regarded as doctors. They just say, in effect, "we're free to do it, come aboard". The Australian Chiropractor's Association regard "doctor" as a "courtesy title" that apparently ought to be available to any health professional who has done 5 years' study, whether of medicine or otherwise. They argue that because dentists and vets have begun to use the title "doctor" this should be extended further. But, there is nothing in the new health practitioners law that limits the use of the term doctor to those with 5 year's study.There is nothing in the law that limits who can use of the term "doctor" (or for that matter "physician" or "surgeon") at all. If chiropractors and osteopaths are doing it, soon it may be podiatrists, Chinese medicine practitioners, acupuncturists, pharmacists, nurses and midwives. Some of these professional groups seem more restrained in claiming to be doctors than others. The Chiropractic Board is also right to draw its members' attention to the Trade Practices Act (now replaced by the Competition and Consumer Act 2010), although they seem to suggest that following their guidelines will comply with the Act. I wonder if this is so. I am not a trade practices lawyer, but I wonder if this kind of behaviour is not prohibited by any number of provisions under the Australian Consumer Law. Why does any of this matter? Because people may be deceived. Because they may be denied medical care on the false assumption that they are seeing a doctor and that the doctor will have in mind anything really medically serious they need to attend to. Because there is a mounting death toll from people who have used alternative medicine instead of medicine. And because the use of the term "doctor" in relation to people who are not is untrue. The Australian Competition and Consumer Commission did a great job in cracking down on the bogus Power Balance bracelets. Now's the time for them to find the right case to run against the misleading use of the term "doctor". Dr Stu - ICT Specialist. I like the sound of that. Think I'll stick it on my business card. You might be able to call yourself a professor. Actually, I was thinking perhaps teachers should all be doctors for the sake of courtesy. doctors [academically qualified] are teachers, this does not make teachers either academically qualified or authorised to be called Doctor. Well said. As one who struggled hard to get a doctorate (Ph D), I object strongly to any people calling themselves doctors who have not had a similar professional rigour applied to their claim to the title. The most important point though, is the one raised in your second last paragraph. PS Would you mind correcting the spelling of 'complementary' - not because I am a spelling nazi, but because 'complimentary' creates ambiguity. Thanks, have corrected it now. I wish I was better at proof reading. We need a petition to ask the relevant lawmakers to change the law and/or make it more specific. I believe the title "Dr" blatantly misleads many people in the community into believing that the professional they are consulting is ordained as "good and safe" by the government. It implies that someone is extremely trustworthy and is backed by a system that stands by the same principles as this "doctor". I remember having an argument in 1973 with a friend's old school mate who had gone to Florida from Armidale, NSW and trained as a chiropractor. He had signs saying "Dr Jim ----, Chiropractor" on his ritzy-looking practice door. I argued with him that it was misleading, but he reeled off the old "years of training" spiel in return. However my dentist in Adelaide was understanding when I questioned him about the "Dr --" sign on his practice- he said it was more business advice than his preference to advertise himself this way. A Survey Monkey poll might be a good start to gauging the perceptions of everyday people at large about seeing "Dr" in front of someone's name. [From the Cranky Proofreader, also a spelling Nazi, but often guilty of writing complete crap myself when seething with rage about some issue]. both good ideas, a survey monkey and a petition. Feel free to start one, I'd be happy to comment on questions and/or promote the poll. In my old country during the early 40s a fully qualified medical professional was called an "Arts" indicating the medical stream of his profession. However, the title Docteur was used for senior academically qualified Illuminati beyond the grade of Master. Great post. If you're interested, check out my facebook page 'People for the regulation of the use of the title "doctor" in Australia'. I`l have a look, thank you for pointing it out. Great. I had no idea there was already a set of People for the regulation of the use of the title doctor in Australia. I was literally blind to this travesty before my trip to Queensland. I hadn't seen it occurring here in NSW yet. But a bit of Internet research has shown that the title doctor is on the march across Australia quicker than the cane toad. Now I shall have to resurrect my Facebook page. I had been resisting it. It`s a while since I read your page. I would have liked to have had a chat on this topic as it`s an important one if the `Dr` is not indemnified.I could not contact Jessica`s page in 2012 for some reason so if either of you pass by this way could please leave a trail so as I can contact please. I've never met one who calls themselves Dr's ever. TBH I'm all for Doctors of Chiropractic to hold the title, they are proper physicians and have done more for me than a MD has to be honest. But all that aside a Doctor is a specialist (and should be) in his field. Osteopaths are a bit I dunno, con artistry to me, I've been to one (once I twice can't remember) wasn't thrilled, felt like he was taking me for a ride, my father felt the same. I honestly feel like they do plenty of study to be awarded this title. I'm not sure about some of the others on this list. To me I feel MD's , DC's and Dentists are the specialists of our body's and treat it in different way so should be reserved to be called that. People that think MD's should be the only Doctors are very very very stuck in the past (ancient past mind you) and as I've said before a Doctor should be pretty much the top of his field / specialist and I highly believe the ones I've said (the 3) do count. NZ did a investigation if you would call it that into Chiropractic (biggest in the world) before allowing them to practice in New Zealand (Australia used most if not all of their findings before allowing Chiropractors to be called Dr's etc etc) over several years. Even bigger than those countries who allowed it in the first place. They have a different skill set but are not less skilled in what they do. I think you need to look up what chiropractors are about if you think they are somehow less con-artist than osteopaths. No, they really aren't. They're quacks who think they are not quacks (which is common among quacks) and who are often in the media for all the wrong reasons. Fact is that spinal manipulations are not going to cure everything, neither are magnets (something the founder of chiropractic nonsense was big on). I disagree with quite a bit of this. In my opinion the way to stop misunderstandings is exactly what the Universities have already started to do, and that is create a medical degree that says doctor in it's title. Although an MD (medical doctor) is only AQF Level 9 (Master's Degree) it uses the name of the degree in it's title. I think a lot of people on here misunderstand that MBBS clinicians study for a long time before they can go into a practice (I think about 8 years) but it is all done at Bachelor level (AQF Level 7) so I believe the name should indicate the level of study and we should ignore 'Courtesy' titles. A student that studies at Diploma level only can do 6 diplomas, as I have, and they are only entitled to call themselves at the level they have studied ie Diploma of......., why should the medical profession be any different. A real Doctor (AQF Level 10) is a PhD and the qualification says it all. It should not be about social status or length of time in study, but rather, at the level people studied. Completely agree with you, however a PhD has little value in Australia since you can already do a doctorate after just a bachelor of some applied science. Such a doctor is only a doctor in Australia since in many other countries they are, of course, not recognised. To become a doctor one should first get a Bachelor of Science, which I believe is BSc(hons.) in Australia, then a Master of Science (again not APPLIED science because that it is not an academic degree) and then a PhD. So I come from a country where I did a BSc and MSc during five years which is equal to 7 years studying in Australia. I have an academic title of ir. to indicate it is the highest level of a technical scientific study before the PhD level which means my academic achievements are far higher than somebody who did an Australian bachelor of applied science and then a PhD who commonly call themselves dr. in Australia. Then the medical 'doctor'. Somebody with the highest scientific degree in a discipline where when you duplicate an experiment you do not necessarily get the same results, i.e. psychology, economics, sociology and all medical studies, will get the title of drs. after completing a BSc and MSc . This title has of course the same value as ir. it is just different to indicate whether the holder of the title has a background in verifiable science or non-verifiable science. I fully agree the Doctorate represents not just the length of time in study but the depth and breadth achieved in the subject studied. I happen to be a PhD (AQF 10) in Biblical Studies and the depth and breadth of knowledge of my subject cannot be tied to the length of study, the academical rigour in research is the litmus test. The level and hence the recognition for a MD should be raised to Doctor of Medicine AQF 10 so there would be no degradation of that title, all academical doctorates should be above Master level. As someone who worked hard to earn a PhD, I think that the title should be closely monitored, and should only be used by medical practitioners and those with PhDs. I don't believe that a clinical doctorate is of the same level or standard as a PhD, and that the title should not be the same. I think it is absolutely ludicrous that all and sundry seem to be using the title now- even my cat's vet is a "doctor." I can not understand why people are not happy just using the terms used on their degrees.PhD (Doctor of Philosophy, MBBS (Bachelor of Medicine) etc. The new degree for Australian medicos will add to the confusion MD (Doctor of Medicine) it is a Masters degree and should be called Master of Medicine. Remove the ambiguity, don't pretend it is an AQF10 when it is a AQF9. That is just pure rubbish. Having spent a lifetime involved with the dairy/beef industries, the vets I have seen in practice have performed some wonderful work and of far greater benefit than the average PhD recipient has performed. The conferring of a Doctorate should be precise in its meaning. ie. Doctor of Medicine, Doctor of Veterinary Science, Doctor of Chiropractic, Doctor of Dentistry. The vast majority of the general public is sufficiently aware of the difference between each of these professions to know what they are likely to be treated for when attending any of these health professionals will treat them for. Great post. I enjoyed it. We had the services of psychology for all the peoples. Happy Teeth Dental Dentist On Judges Bunglow Road for Doctor Dentist in Satellite, Vastrapur and Bodakdev and also Doctor Implant in Satellite, Vastrapur and Bodakdev Happy Teeth Dental in Ahmedabad. Just for the record, as someone said a clinical doctorate in her opinion was not equal to a doctor of philosophy (PhD), in my opinion some Masters are not equal to other Masters but our Masters had to do research and reach a publishing standard of research or we failed. On a related note, inflated degree titles don't just apply to 'doctoral' degrees and people with Bachelor degrees calling themselves doctor. I completed a humble Bachelor degree in an allied health profession (the then standard entry qualification) in the early 00's. Since 2012, however, the university where I studied has now rebranded it a combined Bachelor/Masters degree (it's the same for all other allied health degrees they offer) - yet the course is still the same duration (4 years), and is arguably even less-rigorous than the undergraduate degree I completed, since students in all health professional degrees undertake a general first year, with no discipline-specific subjects taught until 2nd year. A fresh out of uni graduate with one of the newer 'masters' degrees looks more qualified on paper to the general public than I am, with over a decade of experience. Rebranding the degree as a 'Masters' has no doubt been influenced by the qualification creep that has existed in the US for many decades (where all medical students graduate with doctoral degrees), to assist with international recognition of the qualification, and for marketing purposes. No doubt it has also been influenced by the University of Melbourne's 'Melbourne model', where all 'professional' degrees are only offered at the postgraduate level; and, of course, unis being able to charge higher fees for 'postgraduate' study. Some time in the mid 00's I was contemplating a career change and enrolled in one of the new graduate-entry Masters courses (condensing a 3 year Bachelor degree into one year) at another institute. The classes I attended were more than half-filled with overseas, full-fee paying students, and the same material was presented (albeit at a much faster and more shallow level) as was given to the undergraduate students. This sort of thing has really devalued postgraduate education. When I was studying my undergraduate degree, fewer than half of the lecturers in my discipline had PhD's, but now they all either have one or are working towards one. Aec Provide Service For study in au , engineering in au , mba in au, graduation in au in Top rank Colleges and Universities Admission. I lived in a country where all university graduates are called Doctor (implying learned-one as intended from the Latin). That people would be confused is a sign of collective immaturity as no one in that country ever goes to a lawyer or dentist when they need a physician. Therefore, like them why don't we simply do away with the professional "doctor" title and have them use the words "Joe Bloggs Physician and Surgeon" or "Jill Smith Endocrinologist" on their wall plaques. It really makes no difference to me if the person treating me is an MD or an MBBS, all I'm concerned about is there accreditation. Sam, what country was that? Sorry, "their accreditation .. "
Thanks for this post. I have recently been led up the garden path by a chiro in Melbourne thinking that he was an actual Dr as that is what he dsiplays. I asked if he could prescribe me something to sleep at night for my back pain and she said no but I want to give you 6 weeks of treatment and you must follow it to the letter.. No change after 6 weeks and I asked for a referral and he said that he couldn't do that but could write me an 'introductory letter' to a orthopedic surgeon. I had to go to a Dr and basically start all over again whilst in pain everyday. I'm such an idiot! I also came across an acupuncturist who also called himself a Dr in Melbourne. I asked him about this and he was quite honest with me. Hence me now looking this up and thinking 'what the hell is going on here?' What a sham. How can this be stopped? I was seriously taken. They are certainly DOCTORS, and specialised in a specific field of medicine, over a higher education degree. They have more knowledge in compare to GPs. My family and I prefer them to treat us, rather than a chemical GP. you and your family are entitled to your preferences. That shouldn't affect the general public's right not to be misled into thinking people have medical qualifications who do not. Not sure what you regard as jealousy behaviour. I actually feel sorry for you. Specialists have a very narrow field of practice and order far more investigations than GPs. They are great in their field but for things GPs see everyday, you would be treated far worse and with more harm being seen by a specialist. I think there is a lot of Hubris and ego on display here. I have been a patient of my Osteopath for many years and have no problem whatsoever with the fact that she uses the title "Doctor." she is an extremely gifted professional. Likewise I have been brushed off in the 5 minute appointment queue of many GPs over the years whose sole objective is to overbook and bulk bill to the max. My Osteo's qualifications are clearly on display on the wall of her clinic. If you wish to know more it is incumbent on you to ASK. So sick of Academic Wankery. All you need to do for a PhD these days is choose some unbelievably obscure branch of science or business and keep your head down for 5 years. I have a mate who has a PhD in statistical analysis, and another who will attain his doctorate in Theology. These people can be called "Doctor" and my Osteopath should not be allowed..? Pffft.. Get real. Ok, you may have liked your osteopath. She may give you a lot of sympathetic attention and indeed be gifted. Nothing wrong with that, and attributes no doubt desirable in doctors, but it is not the basis of conferring the title. Certainly conferring it to oneself is, in my opinion, unjustified. Otherwise the language of your reply is not one of argument "hubris, ego, academic wanker, pffft, get real" - this is in the nature of ad hominem attack - playing the person and not the ball. It does not advance the debate, in my opinion. I am a chiropractor and could not careless if i use the DR title or not. I only use it because i would look less if my colleague's used the title and i did not. Having the DR title or not, would make no difference to my Practice. EGO plus here. In my opinion, you would look better than your colleagues because you would not be following them in using the title misleadingly. Can people call themselves a doctor? Even they aren't able to a finished doctorate or taking to be doctorate. Very impressive and helpful post, thanks for share it. Such a knowledgeable post.. I will must share that. I read 30+ articles but among of them that was the fantastic one. Great web site you have here on Chiropractor, Health and Wellness. This is a good information for doctor in Australia.Browse our comprehensive listings of the best chiropractors in fremantle practices in Fremantle. Great post.Thanks for one marvelous posting! I enjoyed reading it;The information was very useful. Please kindly visit our site to get more information aboutHouse Call Doctor Perth.